Tsuki Adventure is a relaxing game from Hyperbeard, creators of Kleptocats. The game follows the adventure of a lonely adorable rabbit who has resigned from his stressful job and now finds solace in his grandfather’s native village. With a carrot farm inherited from his grandpa, Tsuki enjoys spending time in his little treehouse. He also befriends several new animals in Mushroom village and aims to travel far and wide. Tsuki Adventure’s minimalist gameplay is what makes it so very special, so unique. The soothing music in the background and superb hand-drawn visuals will make you fall in love with this game and its characters. Mind you, this isn’t a pet simulator. Tsuki does what he likes, but you can surely take him to catch fish, play games and interact with various colorful characters. The game’s day/night cycle is in real time, and characters appear randomly any time during the day. It is a nice little simulation adventure game and you must try, especially if you love playing games that help release stress. The game’s main currency is the carrot. You can use carrots to buy important items from the general store, purchase tickets to travel to Yukiyama and the Great City. Follow these tips, hints and tricks if you want more carrots. Time after time, Tsuki will enter something interesting in his personal diary. Whether he travels to a new place, engages in fun activities or discovers something new, he will make sure his experiences are recorded in his notebook. 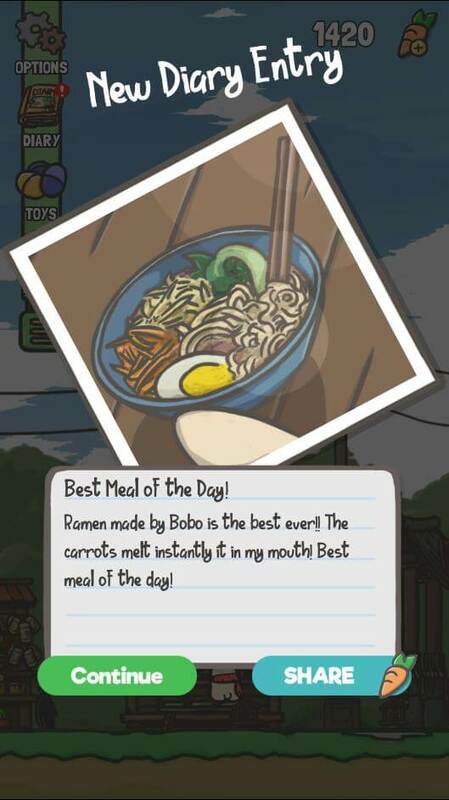 You can get free carrots when you share his new diary entry. You don’t have to do anything, just tap “Share” to get them. You can share his entry to social networking sites. But there’s a nice little cheat to get carrots without actually sharing any entries. All you have to do is tap “share” and then tap outside the pic. This will make all sharing links go away. Now tap “continue” to get your reward. Note: You cannot share the same entry over and over again to get rewards. You will only get them once when a new entry is displayed on the screen. Fishing is a fun activity in Tsuki Adventure. You get carrots in exchange for fish. You can sell them at Yori the fox’s general store. 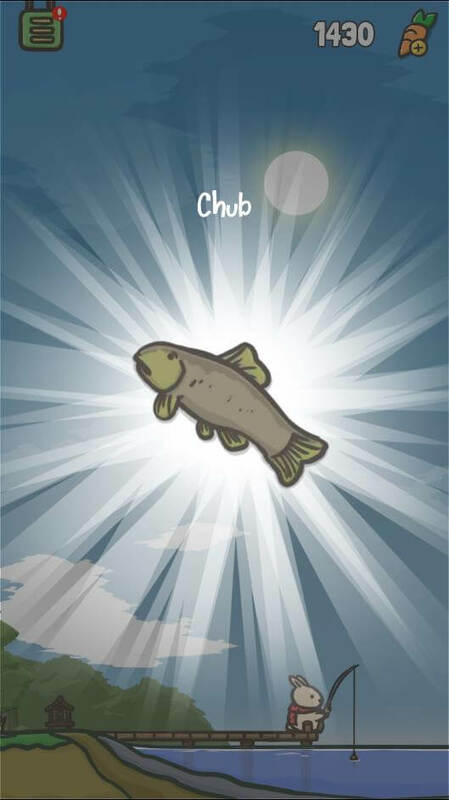 You can fish only during daytime. You will have to wait until the sun shines bright in Mushroom village to begin this activity. Tap the fishing rod kept in his treehouse and then tap “Use”. The fishing mini-game has a quick time event. Tap Tsuki when an exclamation mark appears above him. You will have to be quick in tapping him. The exclamation callout appears suddenly, so be alert. You might catch things other than fish. They too can be sold at the general store, but at a very less price. Once you have caught lots of fish, you can go straight to Yori’s general store to sell them. The rarer the fish, the more they cost. The game offers daily rewards for players who make sure they check what the cute little rabbit is up to every day. Make sure you do this to get carrots as daily rewards. You will also receive tickets on certain days. You can use a ticket to get a toy from “Gachaboy”. Keep logging in daily and you will be in for a big surprise on the seventh day. You will get lots of carrots and more than one ticket. Once you get a daily reward ticket, go to the “Gachaboy” (located next to the shopkeeper) to get your new toy. Don’t forget to tap the share button to get carrots. You can try our share trick to get them. Harvesting carrots is one of the best ways to get them for free. You can harvest 50 carrots every two hours. Tap the big tree near Tsuki’s house when it’s ready. You can get more carrots from the plant if you use the fertilizer from Wagyu. 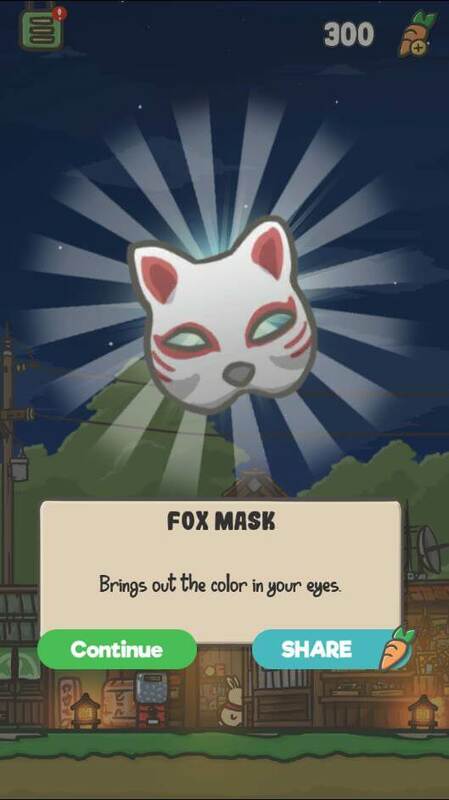 He can appear anytime outside the treehouse, so make sure you open the app frequently. You can get bags of fertilizers from him in exchange of watching a video. The plant gains a star when you use manure on it. The more star it gains, the more carrots you can harvest every 2 hours. You get a maximum of 150 carrots every 2 hours when it gains 5 stars. You will get 50 carrots from talon the owl if you watch a video. This cute owl appears at night, perched on top of Tsuki’s mailbox near his treehouse. 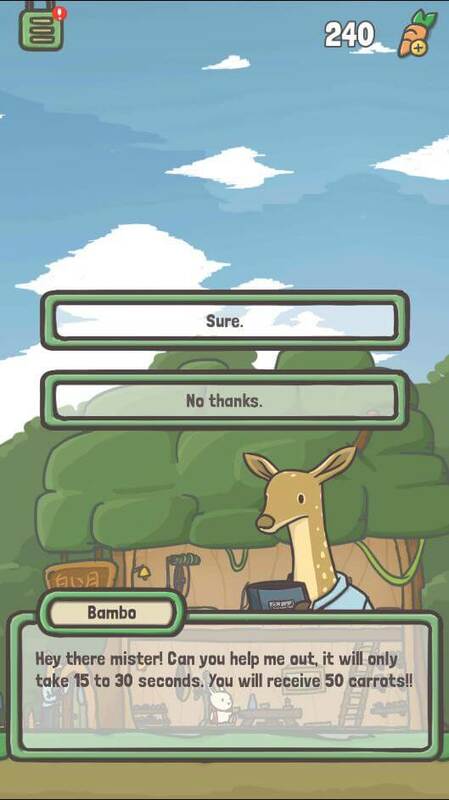 Bambo the deer also offers 50 carrots in exchange of watching a video. He will usually mutter “survey”, but it actually is an advert, which you need to watch to get carrots. 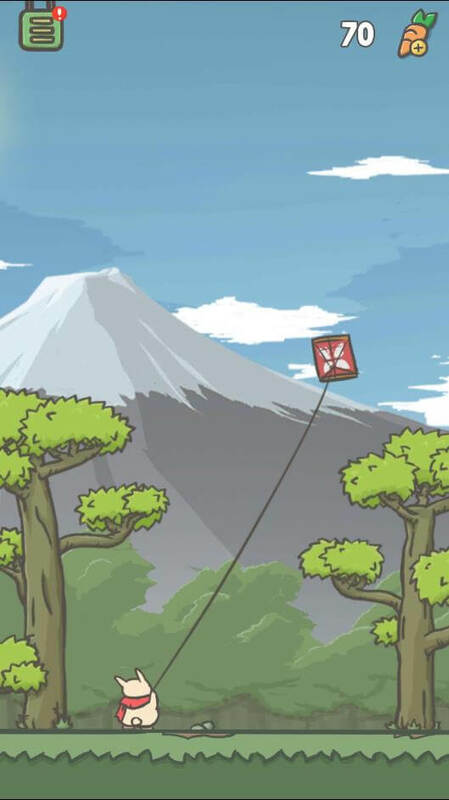 He may appear randomly near Tsuki’s treehouse. You will come across more and more animals that might have such cool proposals waiting for you once you leave mushroom village. Do leave a comment if you find them. You will get lots of carrots if you complete simple offers such as installing an app on your Android device. Tap the “+” icon on the upper right corner of the screen and then tap “Free Carrots”. A list of offers will be displayed on the screen. You can obtain carrots if you enter certain codes in the safe. Tap Menu > Options and then tap the safe icon on the lower-right corner of the screen. Enter the code to get your rewards. When entering a code, keep in mind that it could be a hit or a miss. Safe codes expire after some time, but there’s no harm in trying. Also, you might find some codes in the comments section of YouTube if you are watching a gameplay video. For me, “yaytsuki” code worked and I got 1000 carrots. Try it! That’s all folks. Please do leave a comment if you find some more tricks to obtain carrots. You can also share working safe codes in the comment section to help fellow players get more rewards.